The community in Falcon Lodge came together for an afternoon of discussion about the future of the estate on Friday 12 January. In the first Community Conference in the area, residents, Councillors and representatives from key agencies (including BCC Housing, BMET college, YMCA, local schools, the Youth service, Sutton Coldfield Children’s Centre, MUBU, Job Centre Plus, local churches and community groups) debated the strengths of the local community and what they would like to see in place to improve the lives of residents. 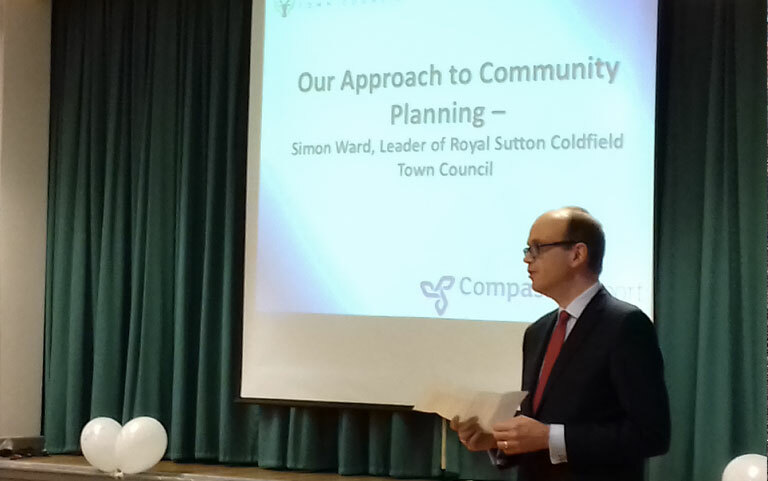 The conference is part of a piece of work by Compass Support and funded by Royal Sutton Coldfield Town Council to create a robust Community Plan for Falcon Lodge to run from 2018 through to 2021. As part of the planning, Compass Support have been carrying out research and consultation with key agencies and members of the community to capture the strengths, needs and aspirations for the Falcon Lodge estate, and the discussions from the Community Conference will contribute to this research. Summing up the deliberations of the afternoon Ifor Jones, Director at Compass Support, highlighted “the need for better communications with residents, environmental improvements and enhancements such as the Town Council’s In Bloom initiative, better use of and improvements of existing facilities including Falcon Lodge Community Centre, closer working between agencies and recognition citywide of the investment needs of the Falcon Lodge estate”.